Wonderful villa situated in Lucca surroundings, once residence of Felice Matteucci, the inventor of the combustion engine. This villa was beautifully restored and turned into an extremely comfortable and elegant private villa providing splendid interiors furnished with antique and fine pieces of furniture. 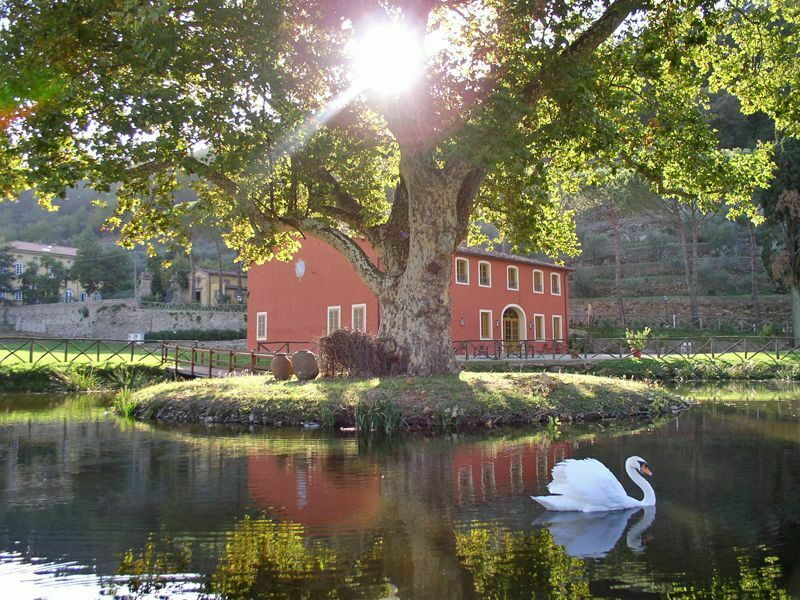 A charming pond with swans and ducks is in front of the villa and offers a nice attraction for adults and children. A wooden bridge leads to a small island in the lake with an imposing, magnificent tree providing shade to a table and with a bench. The location of this villa is ideal to enjoy the peace of the beautiful surrounding country-side and at the same time to visit the neighbouring towns of Lucca and Pisa as well the Versilia coastline area (Viareggio and Forte dei Marmi) with beautiful beaches, fancy restaurants and night life. The Cinque Terre park is in a 1-hour drive (approx. 80 km away). Distances: Lucca with general stores and railway station 4 km away, Pisa (airport) 20 km away, the Versilia coastline area (beaches) 30 km, Florence 75 km away, Cinque Terre 80 km away. At guests’ disposal: large garden with garden furniture, private swimming-pool (12 x 6 m – min. depth 1,6 m – max. depth 1,8 m – open from 01/05 to 30/09), barbecue. The villa provides air-conditioning and WI-FI internet connection (free of charge). Laundry (washing-machine and dryer). Extra services included in the rental price (for 2016 season): breakfast and cleaning service every day except for Wednesdays. Chef available for a dinner or a lunch / a week (the chef is not available on Wednesdays). Extra services to be paid on the spot: Baby bed (upon request): € 100,- per week. Extra bed: € 100,- per week. Maid service by arrangement (€ 20,- / per hour to be paid on site). Ground floor: beautiful living-room (satellite TV, DVD reader, hi-fi) with fireplace and large windows overlooking the small lake in front of the villa, spacious living-room with frescoed vaulted ceilings and dining area, well-stocked kitchen (oven, freezer, small wine cellars, dishwasher, toaster, microwaves, ice maker), laundry (washing-machine, dryer), double bedroom with double sofa-bed and ensuite bathroom with shower, toilet. 1st floor: twin-bedded room with ensuite bathroom with shower, 2 double bedrooms with ensuite bathroom with bathtub, double bedroom with ensuite bathroom with shower and bathtub, 2 double bedrooms with ensuite bathroom with shower.